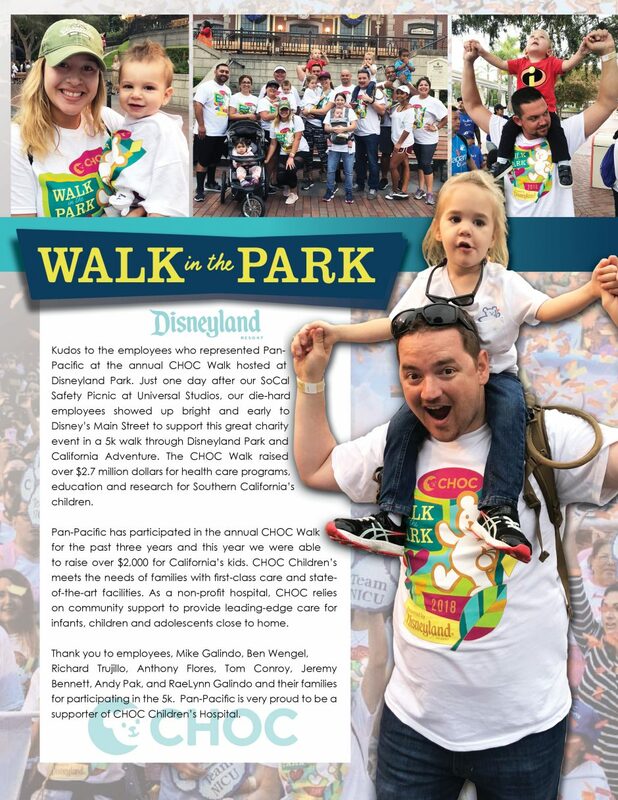 Kudos to the employees who represented Pan-Pacific at the annual CHOC Walk hosted at Disneyland Park. Just one day after our SoCal Safety Picnic at Universal Studios, our die-hard employees showed up bright and early to Disney’s Main Street to support this great charity event in a 5k walk through Disneyland Park and California Adventure. The CHOC Walk raised over $2.7 million dollars for health care programs, education and research for Southern California’s children. Pan-Pacific has participated in the annual CHOC Walk for the past three years and this year we were able to raise over $2,000 for California’s kids. CHOC Children’s meets the needs of families with first-class care and state-of-the-art facilities. As a non-profit hospital, CHOC relies on community support to provide leading-edge care for infants, children and adolescents close to home. Thank you to employees, Mike Galindo, Ben Wengel, Richard Trujillo, Anthony Flores, Tom Conroy, Jeremy Bennett, Andy Pak, and RaeLynn Galindo and their families for participating in the 5k. Pan-Pacific is very proud to be a supporter of CHOC Children’s Hospital.